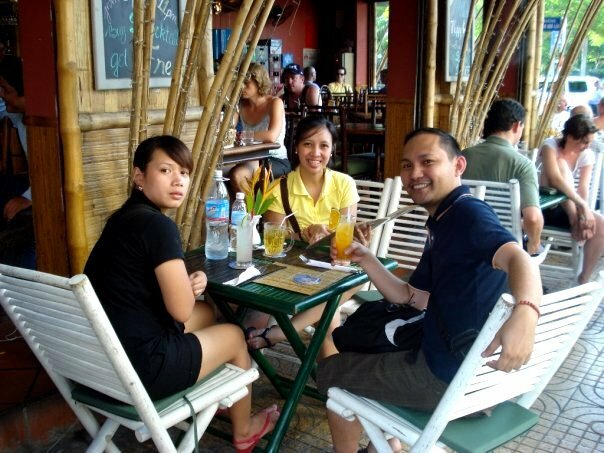 As I can vividly recall, it was in the year 2008 when I was in 3rd year of my law school and during the week of my final examinations, when I decided to travel alone to Bangkok, Thailand to have a sort of semi-reunion with my friends Jaja and Sol. In the middle of the final examinations week (Thursday), I left the Philippines and went back on the day of the exams (Monday), on a major subject critical as basis for evaluation to be part of the much-coveted list of senior (graduating) law students. However, with luck at my side, I passed the subject and at the same time enjoyed Bangkok, Thailand, my first southeast asian trip. And the rest is history. 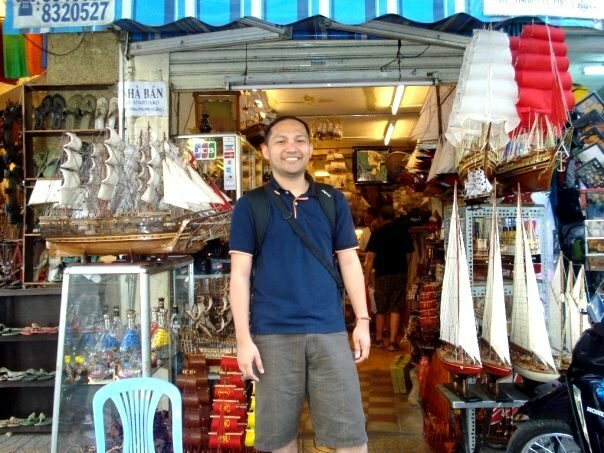 The Bangkok trip started it all... every year I make it a point to travel to our neighboring countries, to discover the culture, the places, the food and meet its people. I intend to complete the list of Southeast Asian countries visited, if the resources and time would permit. Nevertheless, for the time being, here are some of the highlights of the said trips and tips whenever you decide to visit said destinations. The four-day adventure began in a night at Patpong, Bangkok. The area is known as one of the worlds most famous red-light districts. At this point, it pays to have a friend who knows how to speak the Thai language. While in the area, we were approached by a man offering us to watch a show of women performing creative acts involving their genitalia at a discounted price. The most striking of which is the projectile table tennis or the "pingpong show". Once inside, you will be amazed of the skills they possess but wait until the bill is handed down. The serving staff offered drinks, but me and my friend refused the said offer. After a few minutes the bill was presented and indeed, it was inflated. Of course, we have to violently react with the said bill but to no avail. as there was even a threat of physical harm if the bill remains unpaid. I could not understand a single word as my friend hurdles with the bouncer and the manager in Thai language and after a few minutes, they succumbed to our complaint. My friend told me that they requested we keep silent with other customers regarding the actual value of the bills in the bar. After a few minutes, a group of Indonesian boys sat beside our couch...to my mind, they are the next victim. True enough, when presented the bill they raised their complaint but since no one knows how to communicate with the culprits in their own native language, they have to pay the bill. By the way, my friend always advises me that when staying at areas like this, always bring your passport or a photocopy of it to save yourself from trouble. Raid operations is a usual scenario in this area. Despite the urbanization and modern living within the city, Thai culture has been greatly preserved. Even in malls and large commercial complex, there are various mini-temples for buddhists and monks are likewise visible. I was able to visit the Grand Palace and the Temple of the Reclining Buddha via the chao phraya river. The chao phraya river is not that remarkable, there are portions where garbages float and can be likened to the Pasig River here in the Philippines. However, this has been greatly promoted by their government as the most convenient way to travel to the various historical and architectural landmarks of Bangkok, thus, left with no choice...the cruise has been part of most tourist itineraries and a must try. I just hope the same is done here in the Philippines as to the Pasig River. Visiting the temples entails a long walk. As soon as we disembarked from the chao phraya river cruise, a lot of souvenir shops await for those interested in Thai historical artifacts. 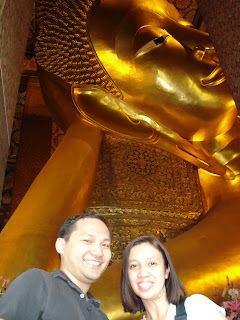 Then, we walked to the temple of the reclining buddha and another walk to wander in the Grand Palace and the temples. We were all perspiring but who cares, I said to myself, I bargained my time to study for this trip and so I must enjoy and make the most of it. While in the temple, my friend Marisol who works in Bangkok was coordinating with a travel agent regarding our seats for the Siam Niramit, listed in the Guinness World Records as one of the notable cultural shows. I highly recommend that you watch this show to experience Thai's arts and cultural heritage. We were able to secure the best seat then and after wandering in the palace, we headed to the MRT subway to catch the scheduled show for the day. Before the show starts, a buffet is served and those who are lovers of Thai food would definitely enjoy this one. Regarding the show itself, no words can explain but it's simply amazing! It was all worth it. I promise to be back in Thailand and blog more about the culture, the food and the places to visit. Be careful when crossing the streets. Fast-moving motorcyles are very much visible, which makes me think you are not a vietnamese if you don't own one. 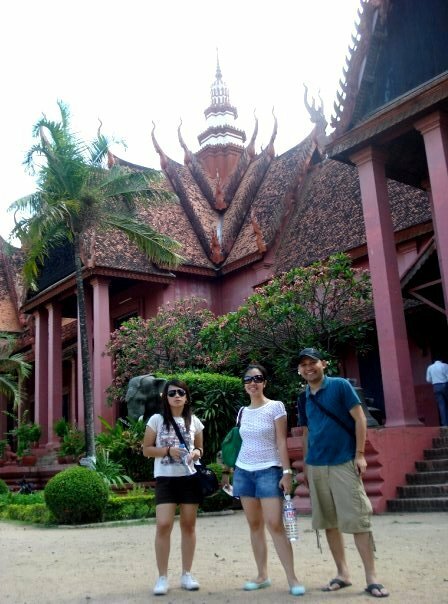 Our trip to Ho Chi Minh (Saigon City) is actually a sidetrip only as we are actually bound to see the Angkor Wat of Cambodia. We stayed at District 1 also known as the Backpackers street, and true to its name, a lot of foreigners stay in this place for a transient. Thus, accommodations is never a problem in this area. Plus, if you want to know how it feels to be a millionaire, stay in Vietnam and see for yourself! The Reunification Palace, the Notre Dame church, the Allez Boo burgers and the vietnamese cuisine and its people (with features like a mini-chinese based on my opinion) are the things I can remember in this overnight trip. Group exercises and sessions, other sports and recreational activitites are also available on its parks even at 10 in the evening. My travel buddies Fate and Jaja tried to join the group as well while I wander on my own. Healthy living indeed! I know I have more to discover about the city and I hope to return as well to share more insights of the city. Infrastructures need to be developed in the city, roads has to be asphalted as it is dusty all over. We were also able to find an internet shop near our hotel, which is a good point for us, made friends with the Khmer and my friend Fate gave them 50 pesos as souvenir which is a thousand of bucks equivalent to their currency. All major commercial centers are named as "Lucky"...the Lucky Department Store, Lucky Mall and the Lucky Burgers. They must have been believers of luck! We were also given free bracelets (i don't know what it's called) by a sales lady from the Lucky Mall. For that, a big thanks to you! ﻿The Angkor Wat adventure then begun. We woke up at around 6AM, late for the expected itinerary of 5AM as set by our tour guide. However, we were still able to see the sunrise as it rises at the famous Angkor Wat. The temple entry pass can be bought near the gates which costs 20 US dollars for a day per person. You have to carry the said gate pass at major temples as the same is inspected for admission purposes. The transport from one temple to the other has been easy and convenient on our part as Mr. Bim, our travel guide/driver was there to assist us. We were able to visit 7 temples including the Angkor Wat and Tha Phrom (the setting for the movie Tomb Raider). The number of visitors in the temple is innumerable and it was just an ordinary day in Cambodia. Carved faces of the king and the apsara dancers were all over the place, with elephants being used as well as a mode of transportation. The scenery was what I expected based on our high school readings of the Asian history on ancient civilization. The pictures will tell how grand and amazing ancient civilization was. The trip was definitely priceless. This the capital city of Cambodia and by no plans at all, we decided to stay for an overnight here before we get back to Ho Chi Minh, which is our gateway back to Manila. We stayed in an apartelle to save money. I already forgot the name of the apartelle but accommodations in Phnom Penh is cheap, safe and readily available. There are a lot of museums in this country, owing to the rich history and preserved culture that they possess. First stop is the Toul Sleng Genocide Museum. The site is a former high school used as the notorious Security Prison 21 (S-21) by the Khmer Rouge communist regime from its rise to power in 1975 to its fall in 1979. According to wikipedia, Tuol Sleng (Khmer [tuəl slaeŋ]) means "Hill of the Poisonous Trees" or "Strychnine Hill". While wandering inside the museum, we can feel the pain and the agony that the Cambodian prisoners has gone through. Pictures of the prisoners/victims I should say, were posted, a cabinet of human skulls and the methods of torture were all displayed. I never took pictures. One visit is enough for me and I swear not to visit the museum again. 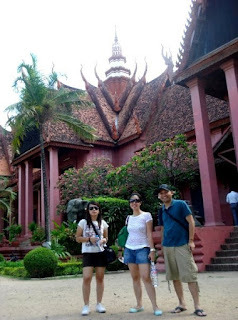 For the sake of experience and to understand more the history of Cambodia, you may visit the said museum. As for me, never again. And so we moved on to the National Museum of Cambodia for a lighter note and to appreciate the arts in relation to Khmer's culture and religion combined. We have to recover from what we felt while we were at the Genocide Museum. For foreign visitors, admission costs 3USD. Photography is not permitted within the museum galleries but photographs at the museum courtyard and exteriors are allowed. There are so many rules inside the museum. I apologize I violated one of the said rules due to my appreciation of their sculptures and visual arts. The museum is open from 8AM to 5PM but the last tickets are sold at 4PM. 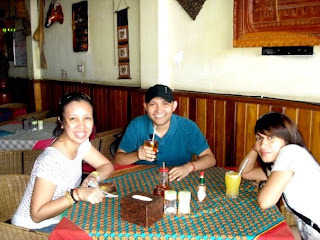 After the museum visits, we wander around the city and take a rest and a refreshing drinks at one of the strips where happy pizza's are served. Due to some negative notions about the happy pizza, we did not try one. After all, we are well-researched and informed travellers. We don't want to be detained at the immigration. For your information, pizza's in Cambodia are served as either "Mildly Happy Pizza", "Extra Happy Pizza" and "Very Happy Pizza"...the happier the pizza, the stronger dose of marijuana. we don't need happy pizza, we're always happy! The Petronas Twin Towers. Petronas Twin Towers. Petronas Twin Towers...honestly, I have more than a hundred pictures of this architectural landmark from dusk til dawn and of all angles and this is the only remarkable site in the country's metropolis. As per consultation with wikipedia, the said skyscrapers and twin towers were the tallest buildings in the world from 1998 to 2004 until surpassed by Taipei 101 (this I have to see), but remain the tallest twin buildings in the world. Going around the city is so easy due to the metro rail transit stations accessibility to major destinations in the country. We wandered around the city by walking as well, shop at the night market and stroll at the Chinatown. For budget travelers, a lot of apartelles and transient dormitories are available in chinatown. But cleanliness is a big issue on the said district. Speaking for myself, even if on budget, I cannot withstand to stay in a cheap apartment or hotel yet the security and hygiene is compromised. And so we were able to look for a two-star hotel in Chinatown which has a reasonable cost. Another must see destination while in Kuala Lumpur is the Batu Caves, located 13 kilometers north of Kuala Lumpur, Malaysia in the Gombak District. This is one of the most popular Hindu shrines outside of India. It is easy to go there as buses are available at the Puduraya Terminal to avoid cutting trips. An alternative is through the Komuter train from KL Sentral Station or the taxi cab which may cost from 20-25 RM on a metered taxi ride. Once inside the premises of the Batu Caves, beware of numerous macaque monkeys as they are almost everywhere ready to be fed by visitors involuntarily. Lesson: do not bring food! Trust me...my friends' food was grabbed from her and for seconds, we disturbed the tranquility of the temple by our voices. These monkeys may pose a hazard to tourists especially to small children and I hope the caretakers do something about this. At the Batu caves also known as the limestone hill, as different limestone formations are found, the world's tallest statute of Murugan, a Hindu deity, can also be found as shown in the picture above. From Kuala Lumpur, Malaysia, it is advisable to travel directly to Singapore through bus to save money. It is easy to find a bus at the Puduraya Terminal and it costs less than 1,000 in Philippine peso for a one-way trip. Likewise, trips are on an hourly basis, so you don't need to hurry to catch up the travel. Rates may have vary since my date of travel, so to be safe check also with the bus companies such as the StarMart Express Air Asia Liner, First Coach, Transnasional Coach Services. Drop off point in Singapore depends on the bus company On our case, since we don't have maps and we traveled late at night to arrive early morning in Singapore, I already forgot where exactly we were dropped off. To date, I have been to the Lion City twice and kept on praising how the government was able to maintain a well-disciplined population, organized and well-landscaped country...thanks to the urban planners of this city and its enforcers for the remarkable implementation. Most Filipino tourists I know, once they step on this country would later dream of working here. And I am not an exception to that. But the same remains a dream... I am still here in the Philippines. 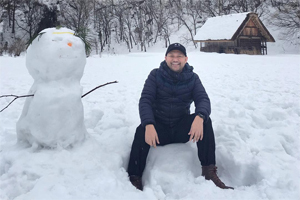 Of the many tourist attractions in the city and the fast development of its tourism, infrastructure and commercial sectors, still there is a lot of catching up to do. Based on my visits, I recommend dining at the Clarke Quay to be able to acquaint with other tourists, shop for souvenirs at the Chinatown for reasonable and affordable prices, stroll at the malls near the Esplanade, take a picture with a view of the merlion in front of the Fullerton Hotel and the durian-shaped architectural dome of the Esplanade, experience the Night Safari, which in my case, gate crashed for a party and saw patrons in halloween costumes for the halloween party (2009), sip for a coffee worth a dollar and treat yourself for a dirty ice-cream sold by senior citizens at the Orchard Road, buy electronic gadgets at a very low price at the Orchard Road as well, a day tour at Sentosa and the newly-opened Universal Studios. Being an English-speaking country, wandering is never a problem for travelers and tourists alike but it is quite costly to live in this country. There are dormitories for backpackers as well in Chinatown, but I cannot vouch as to its safety and sanitation as I was not able to try it. It pays to have friends who live in this country to be able to save for accommodations. For that, a big thanks! To complete the list of southeast asian countries, as per wikipedia consultation, I have yet to travel to Brunei, Burma (Myanmar), Timor-Leste, Indonesia, Laos and to two territories which I have no idea exists - the Christmas Islands and the Cocos (Keeling) Islands. Always remember, it is the journey and not the destination that matters. Keep safe and enjoy life!